My job in the sled was to stop my big head from knocking into the driver. Kind of an odd Olympic memory, but true. The Sochi Olympics remind me of my visit to Salt Lake City just after the 2002 winter games. Like the athletes, themselves, I experienced the thrill of victory and the agony of the feet. Mine were killing me after five days of snowboarding, skiing, bobsledding and Biathlon. Anyone can have these Olympic experiences. You need to have guts and be a bit nuts, but you can do it. 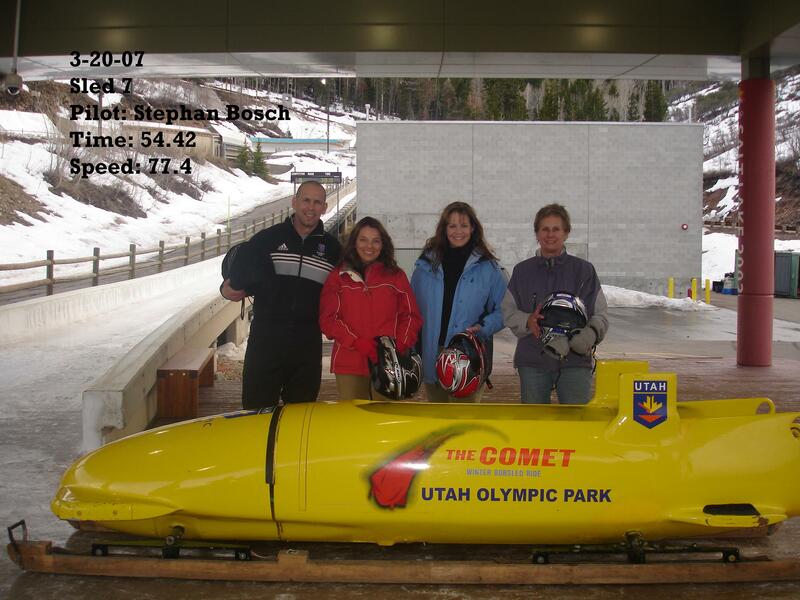 The bobsled at Utah’s Olympic Park is a slick four-man ride called the Comet. It flies down the track at some 80 miles an hour with double the g-forces of a roller coaster. I was right behind the driver and had to keep my helmet-clad head still around 15 bone-jarring curves on a track that dropped 40 stories in less than a minute. It was terrifying and intensely rewarding. It may or may not have led to my hip surgery a few years later. Then there’s freestyle ski jumping, a sport only a human pretzel can love. You can learn this here too, with instructors who teach on terrain parks in winter and special ramps in summer that have you jumping into an aerated pool. The bubbles cushion the blow when you land with your skis in a tangle and arms all akimbo. But with just a few lessons, you may even learn to stick your landing. Now, I know what you’re thinking. Is there anything in the area that’s a little more — tame? The answer is yes, with two world-class facilities for skating and cross country skiing. Framed by the rugged Wasatch Mountains, Soldier Hollow was the site of the 2002 Cross Country and Biathlon events. Today, you’ll find youngsters to seniors swooshing about on trails and terrain for all skill levels. The coolest thing here is the biathlon. Imagine speed skiing around the track and up to the air rifle range, where you drop to your belly and take aim. With your legs in a V- shape behind you, the trick is to hit the target. The final jewel in Utah’s Olympic crown is the Oval Ice Skating Rink. Called the fastest ice on earth, you can lace up and skate the same 400 meter track on which American Sarah Hughes won the gold medal for figure skating. Not up to snuff on your triple lux? You can always try curling under black lights and neon. It’s one event where you can hold your head up high and not worry about it knocking out the guy in front of you.